One of the great things I’ve discovered about eating out in America is that they really know how to do a good breakfast. I’m not talking piles of pancakes covered in bacon, ice cream and maple syrup to start your day off (although you certainly can get that if you want it!) but proper, nice, big, fresh and healthy breakfasts are done brilliantly too. Whilst they’re still larger than your average portion you cannot deny the freshness and the quality of the food. Eggs are always done expertly and whilst it’s different from what we’re used to back home, I really love the way they do bacon. 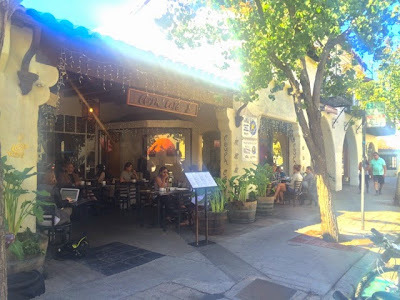 On a road trip one weekend my friends and I decided to stop off in Palo Alto for breakfast. Palo Alto is really nice little town full of restaurants and cafes and home to the infamous Stanford University. We had a really good wander round nosing in all the nice shops and trying to pick which of all the charming looking cafes we were actually going to eat in. Settling on Coupa Café we got in the queue and went up to order breakfast before getting settled on a table out the front as it was a gorgeous sunny day. 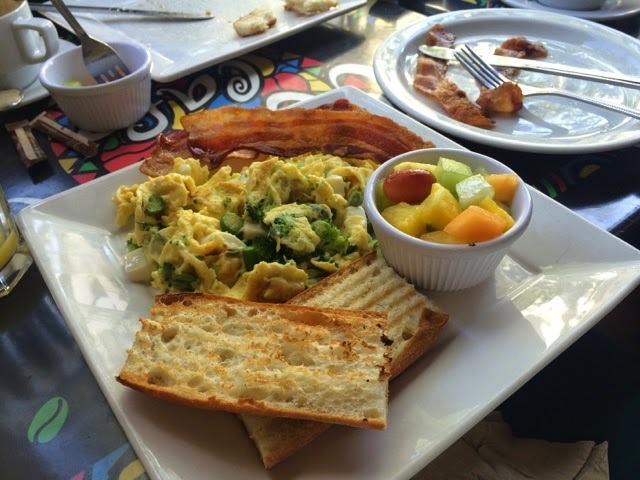 I chose scrambled eggs with broccoli, asparagus and mozzarella which came with a couple of pieces of lightly toasted baguette and a small pot of fresh fruit, I also ordered a side of bacon. Firstly, the portion size was very generous and the addition of fresh veg in with the eggs really gave the whole thing a great nutritious lift. The cheese added bags of flavour too, mozzarella was a great choice over something like cheddar or similar as it didn’t over power the whole thing or feel too heavy. I love the fact that they give you a little fruit pot on the side as it almost feels like a little dessert. I’d love to have a little Coupa Café on my doorstep at home as it really does a great breakfast to set you up for the day and for a long day sight seeing, shopping and trekking around San Francisco this was just what I needed.